Sew Many Ways...: Do You Do Crazy Things Too? Do You Do Crazy Things Too? We all have certain "things" that we do: daily routines, chores, little habits in our lives, even "things" when we are sewing etc. However, is there something that you do that makes you think, hmmmm, am I the only one in the world who does this? I was thinking about this the other day when making school lunches for Kelsie and my husband. When I start a new loaf of bread, not only do I skip that dried up little end piece of bread, but I skip the next piece too. Crazy...I know. My thinking is that those 2 extra pieces keep the rest of the loaf from becoming stale. So when the loaf of bread is done, I have the 2 end pieces and that one extra piece that has "guarded" the loaf the whole way down. I know you're laughing, but we all do something right?? Please tell me I'm right. I also do crazy things when sewing...when I'm chain piecing a stack of blocks, I back stitch at the beginning and the end of every square, I just don't stitch away. The purpose of chain piecing is to speed up the process, but I back stitch at every start and end. I've become so good at it, my hands are flying from the pile to the back button and then back to the pile again. It would be nice if the foot pedal had the back stitch feature on it so your feet could do the work. Why back stitch? I've found that the seams start to open when you start sewing the blocks together and I'm afraid the seam will open too much in the finished quilt. Am I crazy? One more crazy thing I do when pinning blocks...I keep the pins in my mouth!!! Yikes, I know...learned that doosy from my mom! What crazy things do you do? Go on...admit at least one. We're all friends here right? Thought I'd leave you with a picture of some fabric I purchased with my birthday money from my mother-in-law (how did 45 come up so fast?). This is Moda's Rouenneries by French General. This whole line is just beautiful! I wanted it all, but started with 5 yards...1 yard of each. I'm one step closer to starting a project...just need a pattern. Any suggestions? Okay...so I love cheese and crackers.....I will eat it for lunch or breakfast...but normally a person needs four crackers to one piece of cheese, I have to have five....have too...just to have left over to eat by itself...go figure??? I'm known to do lots of backstitching as well, especially on my applique. I wouldn't want the applique stitches to come out when the quilts finished. 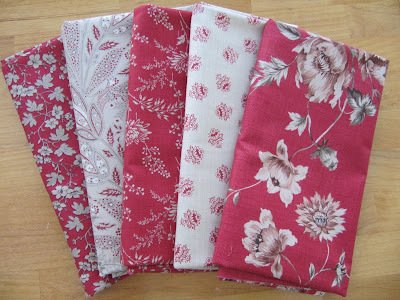 I recently purchased some of the Rouenneries fabric also, isn't it gorgeous? Love it! I absolutely hate to go into the bedroom and find the bed unmade, so to avoid that, I make it as soon as I get out of it in the morning. I don't do much backstitching when I chain piece - I change the length of the stitches to help keep them in place. Oh, my gosh.....I do the same thing with a loaf of bread. Now...I am sure I do a lot of other things that are silly, BUT...since I don't think they are silly, I can't think of any of them right now. Hmmmmm......now you've got me wondering, though. LOL NICE fabric...and I haven't a clue what pattern you should use to make something with it...but be sure to show us when you decide. I do that with the bread too.... that second piece always seems a little smaller than the rest to me. I toast the ends when the loaf is done too.... only way to eat them. I know I do other crazy things, but can't think of anything! I do the same thing with the bread, and the pins in my mouth! I'm a huge fan of backstitching, but when chain piecing, I seem to skip that step. Silly. Love your birthday fabric! Just hang on to it for a while and look at it. The perfect pattern for it will show up eventually! Happy Birthday! I do the same thing with bread too! Silly - Crazy or just normal? I do the same thing with the bread (skip the first 2 slices for awhile then throw them away) -- and I know my mother does the same thing with the pins! Karen, I do everything you do. I promise, I do!!! I do the bread thing, always leaving 2 slices. I always have pins in my mouth and I hate not backstitching each block. Something I do which drives my husband crazy is that I drop my expensive "don't use my scissors ever or I am going to kill you" scissors on the floor all the time. They fall off my sewing table. The fabric is gorgeous...I would quilt them of course. Still on bread - my oldest loved bread in grade school, but not sandwiches. So I would send her cheese, grapes, yogurt and bread in her lunch. But for some reason she would NEVER eat the bread at school. I should have stopped packing the bread, but I couldn't stand the thought of the lunch not being "complete" so I would send the same piece for an entire week. The next week I would begin anew with a fresh slice. I can't think of anything I do, probably cause I think I do things in a "normal" fashion. We are more likely to notice things others do that deviate from how we do things. For instance, my younger daughter eats all of one thing on her plate before she tastes anything else, then eats all of something else, going around the plate until she is done. I have a niece that does this also. My sister loves kidney beans and often serves them as a side dish. Just plain ole warmed kidney beans...but,when she puts them on her plate she take a spoon and dots each and every bean with a tiny dot of mayonaixe. It is normal for her but I have never seen anyone else do that...ever. And, I am sure she could tell you things that I do that are only normal for me. I will have to ask her. OK, I do the bread thing (do toast and eat at the end) and have always put pins in my mouth: the mouth is your third hand. I do backstitch on some things but not when chain stitching. My odd thing is that I have different pin holders for different kinds of pins: I have about 5 different kinds of pins I use for different purposes. I do the bread thing, too! When I'm piecing, I keep a couple of pins in my left sleeve. It worked really well until the health department started telling us to sneeze into our elbows. Now I scratch my face when I sneeze! I 'eat' pins too. It was the hardest thing to NOT do that when I taught junior high sewing. I didn't want to pass on my bad habits to my students. Another weird thing I do is to rearrange the glasses in the cupboard every time someone else empties the dishwasher. I like to have them organized a certain way haha. I'm in love with that Rouenneries fabric line, too. I'm contemplating using it in my Bunny Hill Tisket a Tasket BOM. I think I would have to see it in person to decide, though. Oh my gosh it's like I'm looking in a mirror. I've even got the loaf of bread with ends left in it sitting on my cabinet. And everyone of my pins have my DNA on them! Too funny. Okay confession time, I do the same thing with the bread, I never take the newspaper or magazine at the front of the pile in the shop and I always use the same colored pegs to peg an item on the line!!!! You made me laugh. I do exactly the same thing with a loaf of bread. I wonder where we learned to do such a silly thing? I too keep the pins in my mouth until a recent dentist appointment. He not only told me that I was a 'sewer', which blew me away, he told me he knew this because of the signs. What signs I asked through numb lips. He replied, the light ridges on your teeth where you have held them. I now try to use the pin cushion, but do have the odd slip up. I love that fabric. I'm not good with fabric names etc, but I'm pretty sure I'm using one of the fabrics from that range in the first quilt I'm sewing at the moment. It's such a lovely rosey red colour. As for crazy things, I'm with you on that. I keep pins in my mouths, I count as I brush my teeth, I have to match peg colours... the list goes on! this post just made me laugh! I don't eat the ends of the bread either but lately have been thinking of making my own croutons so will try that this week. Saw it on Barefoot Contessa and it looks so easy! I will go around checking everything twice sometimes ! I do the pins in them mouth thing, too, and one time one of them slipped back into my throat, but I was able to coax it back out, although not very gracefully! :) It scared the dickens out of me! I love the feel of pins in my mouth when I sew. I guess it's a bit like smoking-a habit. In our house we fight over the first slice of bread. Maybe it tastes better because it's always homemade bread. Oh my goodness I do the same thing with bread. I will admit that I smell everything before I eat it. I know that's dumb. I do the same thing with a loaf of bread. Looks like many of us do...that is so funny! See there are so many of us doing the same things it can't possibly be silly,can it? The heel of the bread is for crumbs which are easier if dry so by the time the bread is done these should be dry enough.The second slice is to keep sugars from clumping.Works everytime. Have a great year. Fabrics destiny will come to youand it will be beautiful. I feed the heels to the birds. I'm trying to break the pin in mouth habit. I friend just have me a cute wrist pin cushion and it's working, when I remember to put in on. I too leave the heel for later, usually toasted. I also hate putting those little ties back on so I just twist the plastic bag and curl it up under the loaf. A friend of mine use to friek out when I did that....lol We all have our foybels. I am using the same line of fabric in my Schnibbles quilt this month. I LOVE it!!!! I do too many crazy things to even start a list, including putting pins in my mouth. I'm still debating the kit! Happy sewing Karen! I do the same thing with the bread but I toast the ends when the loaf is finished. I don't back stitch, simply shorten the stitch length. Apparently pins in your month is not good for your teeth, you might damage them, I try not to do that. I have done the same thing with the bread before...lol...I will also open individual packages of sweetner and insert the ripped piece back into the empty package when I'm done;0)..so there! Something else thats crazy and why do I do it???? Here's my crazy thing....when I cut a cucumber I slice a bit from the end and then rub that cut part on the other part till it gets foamy......my mom use to do it and I honestly don't know why, but I do it too...I know pretty darn crazy! I do the same thing with bread until my husband comes along and takes the "guardian" piece. And I can't explain to him why he should skip it and take the next slice because it sounds so crazy when spoken aloud. I just bought a jelly roll of that fabric so I could have a little of each piece in the line. I'm thinking of making some LeMoyne stars with it. I thought I was the only one who did not use the first two pieces of a loaf of bread. I have done this for years. Your blog really made me giggle. Thanks for the smile. I leave the "heel" of the bread but not that second piece! My youngest DD, when she was first learning to sew, told me once that she was not a professional yet like me, because she did not hold pins in her mouth when she sewed. Too funny! Pins in my mouth, yes. Heel of bread only, not the second piece. Weird things I do? My crackers must be "right" side up when I eat them. I put food on my plate in a certain pattern around the plate. Meat always is in one certain area, veggies in another, etc. I make a moat out of my mashed potatoes so the gravy doesn't run all over the other food on my plate. And I rinse out a clean glass when I get a glass of water? I have no idea why, I just do! I, too, skip the first two slices of bread ... the teeny, tiny heel isn't enough to keep the rest of the loaf fresh ... plus that second slice is not as large as the other slices ... and who wants to eat a sandwich with two slices of bread that aren't the same size? ha! I LOVE your blog ... I'm so glad I found it! That's exactly what I do with every loaf of bread. I also never buy the 1st item on the grocery shelves - I have to reach back to the 2nd or 3rd item before it goes into my cart. Don't know why, I just do.